A Deep Love: And We're Off! Well it took a little while to get going but we did arrive. After receiving an email at 2:30am to tell us that our flight was cancelled, we managed to get onto a direct flight that had us arrive in El Salvador just 2 hours later than we had intended...we can live with that! I had prepped my young travelling companion the night before we left that one of the important characteristics of international travel was patience, as things often don't go quite as you except. 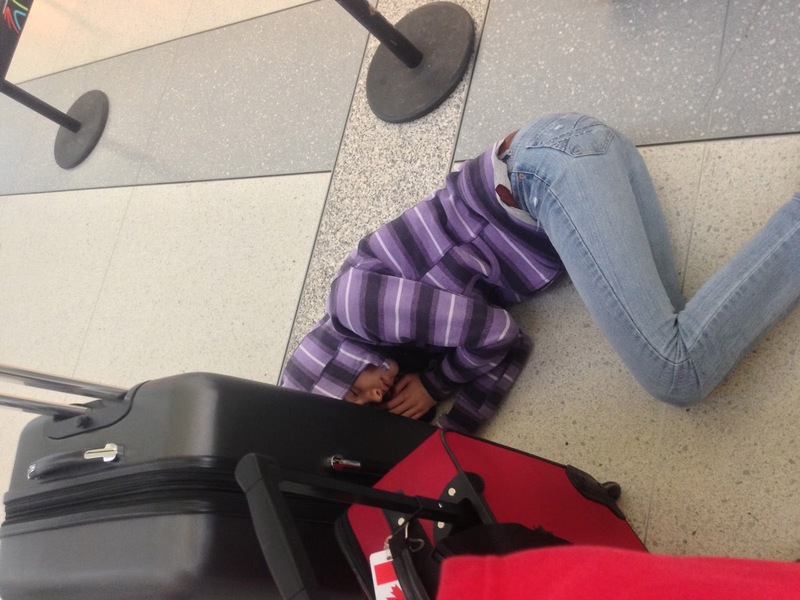 She did great and endured a long day with grace (note the picture...yes she's sleeping on the airport floor; she was there for almost an hour...). As soon as we reached the hotel the rest of the leaders had just started their first round of meetings. I was just on time to lead the devotion. While these kind of meetings are not my favourite thing to do, it is always a privilege to connect with leaders from across our country who share a deep passion for the Lord and for the needy people of El Salvador. One thing you realize quickly with this group, is that their involvement in El Salvador is an extension of what the Lord has been doing for many years in their lives. What a blessing to glean from their experience and their commitment to serve the Lord. "We've discovered that commitment to community building requires fidelity over time...the work is slow, small and often undramatic...it takes years to build the kind of relationships that result in transformation." This quote reminds me that it is so important to identify the "agents of change" that the Lord has established who are committed to serving a local community over a long period of time; once they are identified it is then crucial for us to listen and learn from them so that anything we add is in the context of their perspective and benefits to the whole community over a long period of time. That's why I keep coming back here and that's why it's a privilege to be part of this group of people! Thanks for your prayer. Glad all ended up working out great and that you weren't delayed too long! God's blessing.